URJ: The URJ, the Union for Reform Judaism, is the congregational arm of the Reform Jewish Movement, founded in 1873 by Rabbi Isaac Meyer Wise. The URJ is comprised of over 900 Reform congregations across North America and seeks to deepen Jewish learning, pursue Social Action, enrich worship, and much more. The current president of the URJ is Rabbi Rick Jacobs. 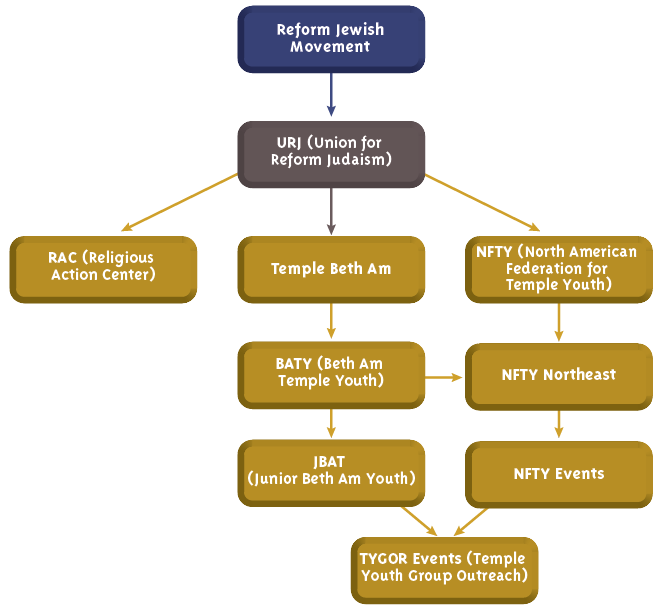 RAC: The Religious Action Center of Reform Judaism, or RAC, is the DC office of the URJ and is a hub for Jewish social justice and legislative activity in Washington D.C. The current director of the RAC is Rabbi Jonah Pesner. 10th graders at Temple Beth Am will have the opportunity to go on a trip to the RAC and will be able to draft and present legislature on several issues pertinent to American Jews to local senators and representatives. 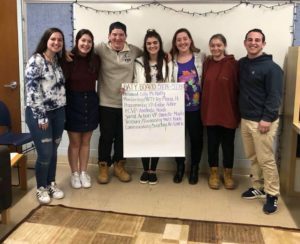 NFTY: The North American Federation for Temple Youth, or NFTY, is a subset of the URJ that focuses on fostering youth engagement and leadership. NFTY provides teens with an opportunity to learn about Judaism, pursue social action, develop strong and lasting friendships and forge their own Jewish identities. There are 19 regions all across North America, and over 500 reform congregations have youth groups affiliated with NFTY. NFTY Northeast: NFTY Northeast, also written as NFTY-NE, is the NFTY region in which Temple Beth Am is a part of. NFTY-NE includes congregations from MA, RI, CT, Upstate NY, ME, NH, VT, and Montreal, Canada. The current Regional Director Of Youth Engagement is Leah King. JBAT: JBAT, or Junior BATY, is comprised of 7th and 8th graders. Through a “Big and Little” system, BATY members reach out to middle schoolers enrolled in the TBA religious school to inform them of upcoming events. JBAT and BATY recently had a “Iron Chef” night in which JBAT and BATY members teamed up to have a pizza-making competition, games and more. Events for JBAT members: stay tuned for upcoming JBAT events, or contact Amy Davis. JOSTY Shul-In: an overnight event for middle schoolers that takes place at Temple Ohabei Shalom in Brookline, MA. It is run by staff and teens involved in NFTY, and gives younger kids a good chance to experience what NFTY events are like. There are several NFTY Northeast events over the year that teens in BATY will have the opportunity to attend. Fall/Spring Conclavette: these are weekend-long events that are hosted at chosen NFTY-affiliated temples in the NE region. Teens stay at host homes. Each Conclavette has a specific theme that activities and programming revolve around. Summer/December Institute: these are five-day long events that take place at either URJ Eisner Camp or URJ Crane Lake Camp. A variety of staff and teen-led programs and events take place during these events, and a “camp feel” is extremely prevalent. Leadership Kallah: a brand-new event taking place in May, which will include leadership workshops and networking while also focusing on transitions (example: seniors leaving) and the community itself. BATY’s Levi Leap: a day-long event ending with a dance, hosted by BATY. MANTY’s Winter Wonderland: a weekend-long event, hosted by MANTY in Manchester, NH. Participants will have the opportunity to ski, snowboard or tube at Gunstock Mountain.